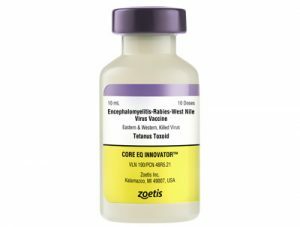 Zoetis’ new Core EQ Innovator equine vaccine contains all five core equine disease antigens—West Nile, Eastern and Western equine encephalomyelitis, tetanus, and rabies—in one vaccine. All of the disease antigens in Core EQ Innovator are backed by the Zoetis Equine Immunization Support Guarantee, which provides horse owners and veterinarians with vaccination support, including diagnostic testing and treatment, the company stated. Available in a 1-mL dose and safe for use in healthy horses three months of age or older. Core EQ Innovator will be available to veterinarians through their Zoetis representative and distribution partners. Visit CoreEQInnovator.com for more information.